Availability: Various days throughout the year depending on departure resort. Don’t Miss: The subterranean lake concert – a scalp-tingling, unforgettable experience! 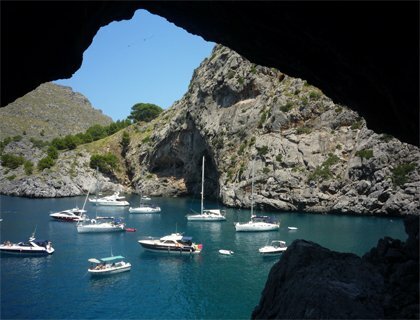 Visit one of the most stunningly beautiful attractions in Majorca – the spectacular, eerie Caves of Drach! This exciting half-day tour takes you across the beautiful countryside of Majorca, past ancient windmills which are still used to pump water from precious underground reserves, to the spectacular Caves of Drach. Filled with stalactites and stalagmites formed over hundreds of thousands of years, the Caves of Drach are one of the most popular destinations in Spain for both locals and island visitors. The three main caves in the Caves of Drach are the Cueva Blanca (White Cave), Cueva Negra (Black Cave) and Cueva Luis Salvator. This final cave features an area known as La Ventana (the window) where you’ll sit beside a beautifully lit subterranean milky-blue lake for a short classical concert – a truly unusual and surprisingly moving experience that’s not to be missed! The exceptional value for money Caves of Drach tour includes a small group guided tour of the caves, the services of an English-speaking guide and return trip transport from various resorts across the island. Transfers to and from centrally located hotels in various resorts are included. When you have arrived in resort, please call the number supplied on your e-ticket to confirm the exact pick-up time for your hotel. Please note that occasionally, the days that this tour operates may need to be changed unexpectedly. In this case, we will endeavour to book a day as close as possible to your original preferred day. Should this not be acceptable, a full refund will be given. Please make sure that you are at the hotel lobby or meeting point at least 15mins before pick-up time. English-speaking guide and hotel transfers from selected resorts.